Horseshoe Plantation: Oconee River in Montgomery County with river frontage with timber and hunting land. 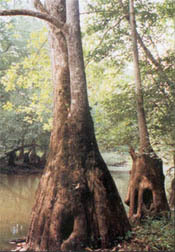 Location: The plantation is located on the east side of the Oconee River in Montgomery County, Georgia about 3 miles south of Mt. Vernon on the paved Old River Road. The property is 100 miles from Savannah, 105 miles from Augusta, and 158 miles from Atlanta. Montgomery County has a population of 8,270. Property Description: Horseshoe Plantation consists of 2000 contiguous acres of level to gently rolling land. It is a beautiful and immaculately developed hunting and timber property and has been managed for deer, turkey and ducks under the present ownership of twenty years. The plantation contains sixteen miles of excellent roads that meander through the hunting lands and along the scenic Oconee River. 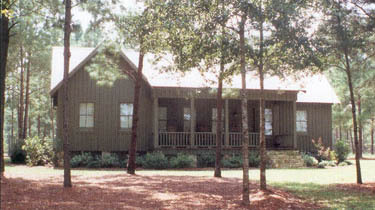 Deer and turkey plots with permanent blinds have been established throughout the property. The entrance gates and long curving drive through the plantation to the lodge are landscaped with live oaks, dogwoods and other indigenous trees and plants. A large field for dove hunting is located along this drive near the lodge. All electric utility lines on the property are buried. The plantation contains 50 acres of water that includes an 8 acre-pond at the lodge, several small cypress ponds, and Oxbow Lake. Fishing and duck shooting is excellent. Improvements Include: A new well-designed hunting lodge with two bedrooms, two baths, living/dining room combination, stone fireplace, beamed cathedral ceiling, hardwood floors, cedar tongue and grooved paneling, modern kitchen, large screen porch and central heat/air. The lodge comes completely furnished. There is also a new storage house for equipment and supplies with a walkin cooler complete with a covered skinning and cleaning rack and concrete floor. An interesting feature of the property is a flowing artesian (8") well. This well is used for supplying water to one of the duck shooting areas. Quality Deer Management QDM: The plantation has been under QDM for the last 6 years. Montgomery County is one of the latest counties in Georgia under QDM. There is an excellent deer herd on the property and many self-feeders are used and maintained for deer and turkey when seasons permit.